I’m not really one for New Year’s resolutions, but a task I did set myself for 2018 was to finally complete my read of Marcel Proust’s multi-volume novel À la recherche du temps perdu (In Search of Lost Time), and having made it through the sixth of the seven parts, I can definitely see the light at the end of the tunnel. Today’s post, then, looks at the penultimate slice of the work, and while plot isn’t exactly a primary Proustian concern, the review will be looking at certain developments in the story. Therefore, if you’d rather not know what happens, look away now. Albertine Disparue (The Fugitive) picks up seamlessly where La prisonnière (The Prisoner) left off, with Marcel stunned to find that his hostage lover has finally decided to spread her wings and fly away. Reading her goodbye letter, the young man struggles to come to terms with his loss, despite the fact that in recent times he was the one hoping for a bloodless end to their relationship. Left alone with his pain (and his housekeeper…), he struggles to come to terms with Albertine’s decision, wondering how best he can persuade her to return. …je compris combien, ce soir où en quittant Brichot, j’avais cru éprouver de l’ennui, du regret de ne pouvoir aller me promener et faire l’amour ailleurs, je compris combien je m’étais trompé, et que c’était seulement parce que, le trésor dont les reflets venaient d’en haut jusqu’à moi, je m’en croyais la possession entièrement assurée, que j’avais négligé d’en calculer le valeur, ce qui faisait qu’il me paraissait forcément inférieur à des plaisirs, si petits qu’ils fussent, mais que, cherchant à les imaginer, j’évaluais. What follows is an examination of how and why he loved Albertine, realising too late the importance she had for him. He starts to develop theories on love and life, and explores the concept of our changing nature; rather than having a constant character, people are actually made up of a multitude of ‘I’s. Marcel claims that each moment brings a different ‘je’, all of whom love Albertine in a slightly different way. A logical extension of this theory leads Marcel to realise that the person we love is not the person, but a collection of images, sensations and experiences attached to a core we would hardly recognise. It’s not really Albertine herself that he was in love with, but the picture he’d built up of her. This is nicely shown in a scene at Marcel’s apartment after Albertine’s death, when his friend Robert de St-Loup is stunned on seeing Albertine’s photo – this is the girl his friend has spent so much money, time and energy on, the cause of all his anguish? For St-Loup, she’s just an average-looking teenager, but in Marcel’s mind, she’s been built up as the epitome of alluring womanhood. In this way, Marcel gradually recovers from the shock, and we suspect that it won’t be long before he’s able to go back to his usual (self-absorbed) way of life. 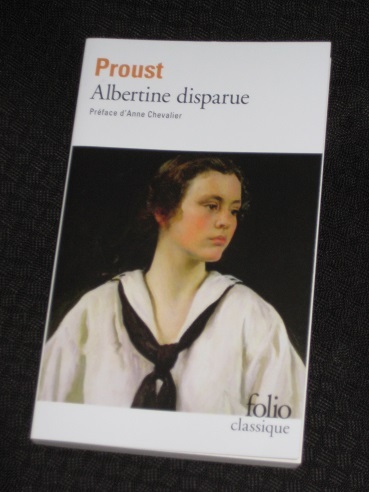 Although Albertine disparue is one of the shortest parts of the cycle, there’s a lot going on in the second half of the book, with a sense that Proust is getting ready to wrap things up. Gilberte, Marcel’s childhood crush, reappears in a storyline bringing together her mother, the Guermantes family and St-Loup. We have a couple of marriages, some deaths and even the long-promised trip to Venice. Perhaps the most significant development here, though, is related to the idea of the subjectivity of people’s characters. In earlier parts of the novel, Marcel is blind to others’ views, believing his own hype; here, he begins to get wise to reality. There’s the small matter of Albertine, of course, and the realisation of how she fooled him, but he finally (belatedly) starts to wonder if society loves him quite as much as he thought it did. Certainly, the lack of real interest shown in his long-awaited debut in the Le Figaro newspaper comes as a bit of a wake-up call. Yet perhaps the greatest revelation is what he learns about his friend St-Loup. Several surprising events in the book reveal a hidden side to the amiable aristocrat, leading us to suspect that his adoration for the young writer might have been faked (or of a different nature to what Marcel thought it to be) all along. 1) Despite his distress at being dumped, the moment Albertine shows the slightest signs of changing her mind, he completely loses interest. 2) Unable to leave the poor woman alone, he dispatches spies to dig up dirt about her both before and after her death. 3) He shows his grief by roaming the neighbourhood and picking up a young girl in the street, an adventure that he’s fortunate to get out of without a spell in police custody. The novel as a whole is undoubtedly great literature, but a modern reader can’t help but be disgusted by the writer’s alter-ego at times (and I’m not entirely convinced that it’s always intentional…). ← Introducing the 2018 MBIP Shadow Panel!